Plant growth is usually limited by the rate at which carbon dioxide is taken up from the atmosphere and converted to sugars via the dark (or “light-independent“) reactions of photosynthesis. The enzyme responsible for the first step in this process, RuBisCO, does not work at its maximum potential efficiency at current atmospheric levels of carbon dioxide (see Limitations on Photosynthesis). Higher levels of CO2 would facilitate more efficient carbon fixation, thus higher rates of photosynthesis and growth. Additionally, CO2 is largely insoluble in water, and diffuses 10,000 times more slowly in water than in air, such that aquatic plants are especially limited by the supply of CO2. Land plants can minimise, through their morphology, the distance between the air and their chloroplasts (the water phase), through which CO2 will diffuse at a vastly reduced speed, but algae do not have this option. This has resulted in the evolution of Carbon Concentrating Mechanisms (CCMs) in most algae. We hope to improve our understanding of one of these mechanisms found in green algae including our model, Chlamydomonas reinhardtii, in order to engineer an Arabidopsis plant which uses the same mechanism to improve its ability to photosynthesise on land. The mechanism found in Chlamydomonas (and other algae) pumps CO2 and bicarbonate (produced when CO2 dissolves in water) towards a small ball of RuBisCO, called the pyrenoid, found in the single chloroplast that Chlamydomonas possesses, enabling RuBisCO to work more efficiently. 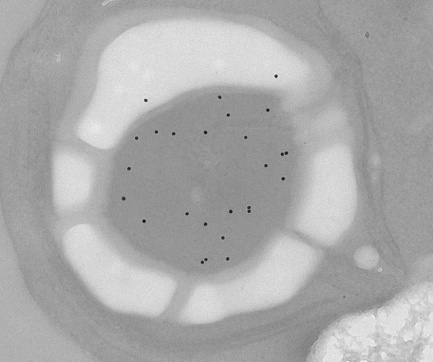 EM of Chlamydomonas cell, with the pyrenoid clearly visible as the dark patch in the bottom left of the cell, and the thylakoid membranes of the roughly horseshoe shaped chloroplast visible around the periphery of the cell. We have recently made important new discoveries about this mechanism, and invented rapid new methods to identify the contributing algal genes. Our current target is to identify the genes required by the algae to achieve high concentrations of carbon dioxide within cells, and then we will attempt to characterise how these genes work. Once we have a more complete understanding of the mechanism in algae, we will transform the most important genes into the model plant species, Arabidopsis thaliana, to determine whether the same CCM can be recreated inside a leaf. If it can, we expect that our experimental plant will have higher rates of photosynthesis and hence a higher rate of growth than normal plants. This work will provide new insights into how plants and algae acquire and use carbon dioxide from the atmosphere. This is of great importance in predicting and coping with the current rapid changes in the atmosphere and hence in climate, and in developing strategies to cope with these changes. The work will also contribute to strategies to increase global food security, by indicating new ways in which crop productivity can be increased. Recent findings in understanding the means by which RuBisCO’s subunit structure and pyrenoid formation are related have uncovered the importance of Chlamydomonas’ RuBisCO small subunit structure. RuBisCO holoenzyme L8S8 consists of eight large subunits (LSU) arranged as four dimers, and eight small subunits (SSU) arranged as two quads. By manipulating specific amino acid residues in the SSUs of RuBisCO), we have discovered that two external specific coiled α-helices per SSU are essential for pyrenoid formation. An unaltered Chlamydomonas cell is found to carry a pyrenoid structure. We replaced Chlamydomonas’ SSUs with an α-helix-carrying spinach (higher land plant) SSU; these Chlamydomonas-spinach mutants did not form a pyrenoid. Even more convincingly, Chlamydomonas mutants with spinach SSUs which had been re-altered to contain Chlamydomonas α-helices formed a pyrenoid once again. These mutants are known as ‘helix’ mutants. Identifying the presence of a pyrenoid is relatively simple; it can visualised using a light microscope. We have also used immunogold-labelling to locate the RuBisCO within the chloroplast, to confirm that the majority of the RuBisCO is concentrated within the pyrenoid. The gold particles bind selectively to RuBisCO (see the electron micrograph, right), although there is some background non-selective binding. It can be noted that in Chlamydomonas, the presence of a pyrenoid indicates that the algae has a working CCM. Photosynthesising using an active CCM is far more efficient than without, and we can use several different techniques to assess whether this is occurring. One of these techniques involves using an oxygen electrode to measure the amount of photosynthesis that is occurring at varying CO2 concentrations. This is known as an assimilation curve. The generalised assimilation curve below shows the results expected for a plant with an active CCM (e.g. C4 plants) versus plants without an active CCM (e.g. the C3 plant). By collecting similar data for each of our mutant lines of Chlamydomonas, we can determine whether they have an active CCM. The initial slope of the ‘assimilation curves’ indicates the efficiency of photosynthesis; it is much higher in plants/algae which are using a CCM. The point at which the curves cross the x-axis is known as the ‘compensation point’, and indicates the CO2 concentration at which there is no net assimilation (i.e. the amount of CO2 fixed by photosynthesis is exactly balanced by the amount released by respiration).